These Ladies Bridal Beaded Purses are manufactured with only beads & threads and are totally handmade. These are no work of Embroidery and zari.. These Ladies Beads Purse Bags blend creativity and style and make perfect match with modern as well as traditional women wear. Beaded Handbag offered is made available in attractive shaped beaded finish. Coming with beautifully beaded shoulder strap, these hand bags provide for vibrant, classy and trendy finish appearance. 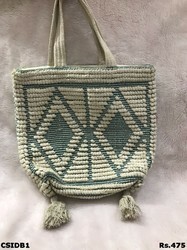 These jute bags are not only good from utility point of view but also come with beautiful and appealing high-fashion finish. We manufacture designer bags that are designed with attention to all the details. These bags are easy to carry and can also be hanged around the shoulders. These bags are available in different color combinations and are even light in weight and fancy. Featuring a Golden colored, hand beaded clutch bag with golden color beads on a pure leather base.. It Comes with adjustable Golden color chunky metal chain.. It comes with a dust bag..
We offer to our clients a wide range of finely finished shopping bags to choose from. Made from quality raw material, our bags are known for their intricate designs, patterns and innovative use of beads which give an aesthetic appeal to our products.